Matthew McConaughey, left, arrives on the Clark campus Sept. 5, 2014. 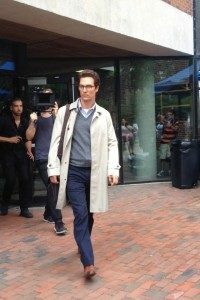 Matthew McConaughey films “The Sea of Trees” outside of Sackler Sciences Center on Sept. 5. Chuck Agosta could have anticipated many things when he chose to become a physics professor, from dealing with procrastinating students to vying for dwindling pools of grant money. But he never would have expected to be coaching a movie star on how to deliver his lines. On Sept. 5, Agosta, chair of the Clark University Physics Department, found himself by Matthew McConaughey’s side, advising the Oscar-winning actor on classroom protocol and the jargon associated with teaching physics at the university level. McConaughey visited Clark to film scenes for “The Sea of Trees,” a story of personal reflection and redemption. He plays Arthur Brennan, a physics professor whose life has unraveled to the point where he treks into Aokigahara, a dense forest at the base of Mt. Fuji in Japan, to contemplate suicide. Check out more photos from McConaughey’s visit to campus. The production company filmed most of the movie in Central Massachusetts, including at Wachusett Mountain and Purgatory Chasm (both doubling for Aokigahara). To film a flashback sequence depicting Arthur’s university days, director Gus Van Sant (“Good Will Hunting”) turned his attention to Clark, visiting the Sackler Sciences Center weeks in advance to find an office that could double as Arthur’s. He was impressed with Agosta’s space, which featured the perfect blend of brilliant-mind intellectualism (lots of books, papers and gadgets) with a touch of scholarly clutter (lots and lots of books, papers and gadgets). Van Sant also settled on a physical chemistry lab in Sackler to film a scene featuring McConaughey with his students (played by Agosta’s physics students as well as his daughter Elyza). The scenes were set in late fall, and, despite that day’s temperatures exceeding 90 degrees, the student extras were asked to dress in flannels, boots and jeans. Adding to their discomfort, the air conditioning in the lab was shut off so the boom mics wouldn’t pick up its hum. 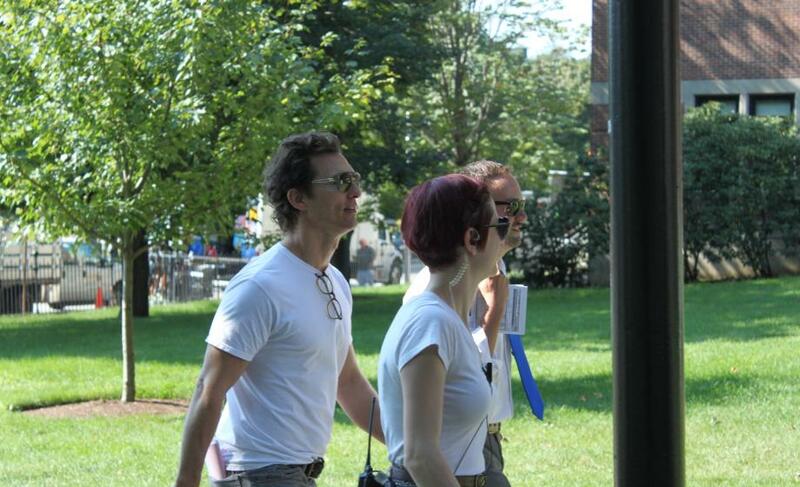 The only time McConaughey ventured outside of Sackler was to circle the building for some exterior shots. By this time, word was out that the actor was on campus and he was quickly trailed by an excited cadre of students, staffers and fans firing off photos on their smartphones. McConaughey remained locked into his character throughout the day, always looking straight ahead when he walked through a hallway or to a waiting van and keeping his interactions to a minimum. Agosta watched the office scenes on a nearby monitor shoulder to shoulder with Van Sant, and, when asked, he would give McConaughey technical tips for keeping the dialogue physics-consistent. Getting an audience with Matthew McConaughey wasn’t necessarily the goal of every Clarkie. Film studies major Emma Ogg ’17, who staked out the set for much of the day, says she was most thrilled to have a brief chat with Van Sant. “I started to understand that our overenthusiastic nature about movie stars and directors is maybe more about the deep admiration we have for their work rather than just wanting to meet a celebrity,” she says. “Their jobs are about transporting an audience someplace else, teaching us something, or making us feel something different than we do in the everyday, and that is the important work.